We, the St Philip Neri Catholic School Community, warmly welcome you and your children. We trust that your association with us will be an enjoyable and rewarding one. St Philip Neri Primary School is part of the Parish of the Lower North Shore. Our parish is led by our Parish Priest – Father Brian Moloney. 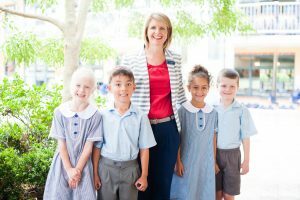 The dedicated and talented staff at St Philip Neri aim to provide quality learning and teaching to foster in your child academic and human excellence. We aim to provide your child with many opportunities to experience Christ in their lives and develop this life long relationship. helping your child to experience God’s love and nurture his/her personal faith in an environment of prayer, celebration, belonging and community. Your child is unique and special with his/her own gifts and we are honoured that you have invited us to share the journey with you as these gifts unfold. St Philip Neri has a culture of respect which honours the dignity of each person. Based upon our school motto “Deeds not Words”, our students are invited to engage in social justice programs, giving expression to our Catholic beliefs, by making relevant connections to the contemporary world. We support you in your fundamental role as the first educators of your child. We aim to work in partnership with you throughout your child’s schooling with a common vision and high expectations, enabling them to reach their full potential. I encourage you to be an active participant in the life of the school and parish and walk with your child through their precious years at St Philip Neri.